Yu Chen, Rachel E. Owyeung and Sameer R. Sonkusale, “Combined optical and electronic paper nose for detection of volatile gases”, Analytica Chimica Acta, accepted, appears online. Meera Punjiya and Sameer Sonkusale, “Exponential to linear conversion for fluorescence lifetime measurement, IET Electronics Letters, 54 (11), 687-689, 2018. Guoqing Fu, Sameer Sonkusale, “CMOS Luminescence Imager with Ambient Light Compensation and Lifetime to Frequency Conversion”, IEEE Transactions on Biomedical Circuits and Systems, accepted, appears online. 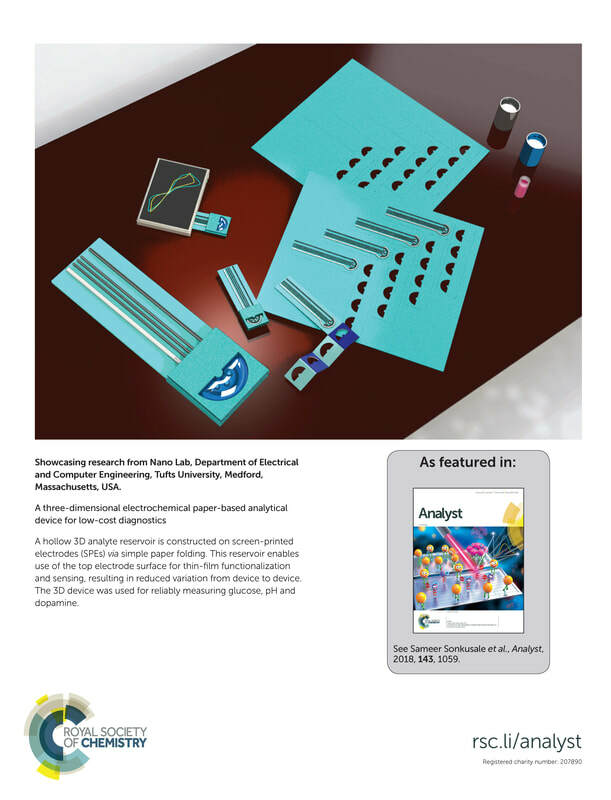 Meera Punjiya, Chung Hee Moon, Zimple Matharu, Hojat Rezaei Nejad and Sameer Sonkusale, “A three-dimensional paper-based analytical device for low cost diagnostics”, Analyst, 143, pp.1059-1064, 2018. G. Della Colletta, L. H. C. Ferreira, S. R. Sonkusale and G. V. Rocha, "A 20-nW 0.25-V Inverter-Based Asynchronous Delta-Sigma Modulator in 130-nm Digital CMOS Process," in IEEE Transactions on Very Large Scale Integration (VLSI) Systems, vol. 25, no. 12, pp. 3455-3463, 2017. Aydin Sadeqi, Hojatollah Rezaei Nejad, and Sameer Sonkusale, "Low-cost metamaterial-on-paper chemical sensor," Optics Express 25, 16092-16100, 2017. P. K. Singh and S. Sonkusale, High-speed terahertz modulator based on tunable terahertz slot waveguide, Nature Scientific Reports, 7, 40933, 2017. Chen, Y., Fu, G., Zilberman, Y., Ruan, W., Ameri, S. Kabiri, Zhang, Y. Shrike, Miller, E., & Sonkusale, S. R, Low cost smart phone diagnostics for food using paper-based colorimetric sensor arrays. Food control, 82, pp. 227-232, 2017. Shideh Kabiri Ameri, Pramod K. Singh, and Sameer R. Sonkusale. "Three dimensional graphene transistor for ultra-sensitive pH sensing directly in biological media." Analytica Chimica Acta 934 (2016): 212-217. Alemdar, Neslihan, Jeroen Leijten, Gulden Camci-Unal, Jesper Hjortnaes, Joao Ribas, Arghya Paul, Pooria Mostafalu et al. "Oxygen-generating photocrosslinkable hydrogels support cardiac progenitor cell survival by reducing hypoxia-induced necrosis." ACS Biomaterials Science & Engineering, 2016. Nuno M. Oliveira, Yu Shrike Zhang, Jie Ju, Ai-Zheng Chen, Yu Chen, Sameer R. Sonkusale, Mehmet Dokmeci, Rui L. Reis, João F. Mano, and Ali Khademhosseini. "Hydrophobic Hydrogels: Towards Construction of Floating (Bio) microdevices." Chemistry of Materials, 2016. Saroj Rout, and Sameer R. Sonkusale. "A low-voltage high-speed terahertz spatial light modulator using active metamaterial." APL Photonics 1, 8 pp: 086102, 2016. Saroj Rout and Sameer Sonkusale. "Wireless multi-level terahertz amplitude modulator using active metamaterial-based spatial light modulation." Optics Express 24.13 14618-14631, 2016. Ameri, Shideh Kabiri, Pramod K. Singh, Anthony J. D'Angelo, Matthew J. Panzer, and Sameer R. Sonkusale. "Flexible 3D Graphene Transistors with Ionogel Dielectric for Low‐Voltage Operation and High Current Carrying Capacity." Advanced Electronic Materials, vol. 2, no. 5, 2016. Y Chen, Yu, et al. "A Flexible Gastric Gas Sensor Based on Functionalized Optical Fiber." IEEE Sensors Journal 16.13 pp: 5243-5248, 2016. Y. Chen, Y. Zilberman, S. Kabiri Ameri, W. Jong Yoon, J. Cabibihan, and S. Sonkusale, “A flexible gastric gas sensor based on functionalized optical fiber”, IEEE Sensors Journal, vol. 16, no. 13, pp.5243-5248, 2016. K. Park, S. Kabiri Ameri and S. Sonkusale, “Dielectrophoretic lab-on-CMOS platform for trapping and manipulation of cells”, Biomedical Microdevices, vol. 18, no. 1, pp 1-11, 2016. 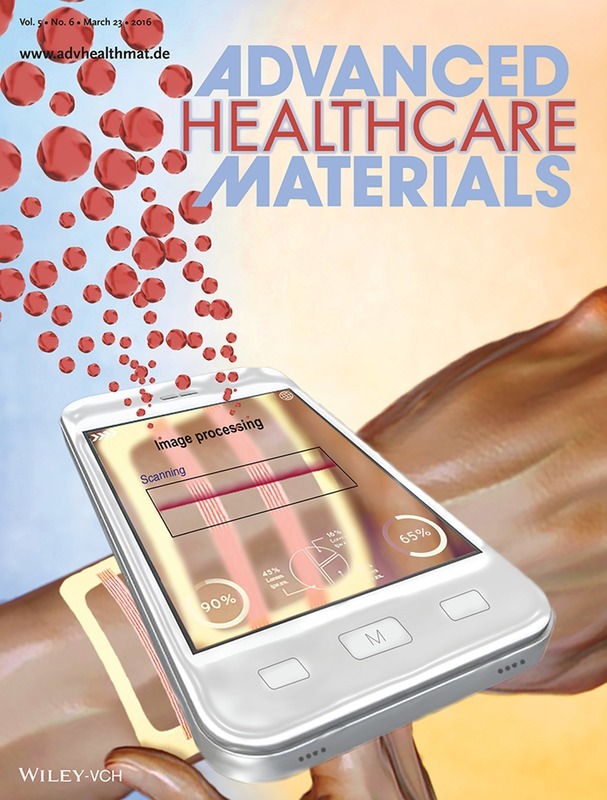 P. Mostafalu, W. Lenk, M. R. Dokmeci, B. Ziaie, A. Khademhosseini and S. Sonkusale, “Wireless flexible smart bandage for continuous time monitoring of wound oxygenation” IEEE Transaction of Biomedical Circuits and Systems, vol. 9, no. 5, pp. 670-677, 2015. Ali Tamayol*, Mohsen Akbari*, Yael Zilberman*, Mattia Comotto, Emal Lesha, Ludovic Serex, Sara Bagherifard, Yu Chen, Guoqing Fu, Shideh Kabiri Ameri, Weitong Ruan, Eric L. Miller, Mehmet R. Dokmeci, Sameer Sonkusale, Ali Khademhosseini†, “ Flexible pH sensing hydrogel fibers for epidermal applications”,Advanced Healthcare Materials, available online, doi: 10.1002/adhm.201500553. S. Bagherifard, A. Tamayol, P. Mostafalu, M. Akbari, M. Comotto, N. Annabi, M. Ghaderi, M. Guagliano, S. Sonkusale, M.R. Dokmeci, and A. Khademhosseini, “Dermal Patch with Integrated Flexible Heater for on Demand Drug Delivery”, Advanced Healthcare Materials, vol.5, no. 1 pp. 175-184, 2016. R. D'Angelo and S. Sonkusale, "Analog multiplier using passive circuits and digital primitives with time-mode signal representation", Electronics Letters, vol. 51, no. 22, pp. 1754-1756, 2015. R. D'Angelo and Sameer Sonkusale, "A time-mode translinear principle for nonlinear analog computation", IEEE Transactions on Circuits and Systems – I, vol. 62, no. 9, pp. 2187-2195, Sep 2015. Guoqing Fu and Sameer Sonkusale, "Broadband wireless RF power telemetry based on metamaterial resonator embedded with non-foster impedance circuitry", Applied Physics Letters, vol. 106, no. 20, pp. 203504, 2015. L. H. C. Ferreira, S. Sonkusale, A 0.25V 28nw 58dB dynamic range asynchronous delta sigma modulator in 130nm digital CMOS process”, IEEE Transactions on VLSI Systems, vol. 23, no. 5, May pp. 926-934, 2015. P. Mostafalu and Sameer Sonkusale, High density nanowire electrode on paper for biomedical applications, RSC Advances, vol. 5, no. 12, pp. 8680-8687, 2015. S. MacNaughton and S. Sonkusale, " Gas chromatography on chip with integrated graphene, carbon nanotubes and vanadium oxide nanowire chemiresistor arrays", IEEE Sensors Journal, vol. 15, no. 6, pp. 3500-3506, June 2015. S. MacNaughton, S. Ammu, S. Manohar, S. Sonkusale, “High throughput heterogeneous integration of diverse nanomaterials on a single chip for sensing applications”, PLoS One, vol. 9, no. 10, pp. e111377, 2015. Alireza Hassani Najafabadi, Ali Tamayol, Nasim Annabi, Manuel Ochoa, Pooria Mostafalu, Mohsen Akbari, Mehdi Nikkhah, Mehmet Dokmeci, Babak Ziaie, Ali Khademhosseini, “Biodegradable nanofibrous polymeric substrates for generating elastic and flexible electronics”, Advanced Materials, Advanced Materials 26 (33), 5823-5830, 2014. P. K. Singh, J. Hopwood, S. Sonkusale, “Metamaterials for wireless generation of spatially controllable two dimensional array of microplasmas”, Nature Scientific Reports, 4, 5964, 2014. S. Kabiri Ameri, P. K. Singh, S. Sonkusale, “Liquid gated three dimensional graphene network transistor, Carbon, Volume 79, Pages 572-577, November 2014. S. Kabiri Ameri, S. Sonkusale, “Utilization of graphene electrode in transparent microwell arrays for high throughput cell trapping and lysis”, Biosensors and Bioelectronics, vol. 61, no. 11, pp. 625-630, 2014. Y. Chen, Y. Zilberman, P. Mostafalu and S. Sonkusale, “Paper based platform for colorimetric sensing of dissolved NH3 and CO2”, Biosensors and Bioelectronics, vol. 67, pp. 477-484, 2015. Y. Zilberman, Y. Chen and S. Sonkusale, "Dissolved ammonia sensing in complex mixtures using metalloporphyrin-based optoelectronic sensor and spectroscopic detection", Sensors and Actuators: B- Chemical, vol. 202, pp. 976-983, October 2014. Yael Zilberman, Sameer R. Sonkusale, Microfluidic optoelectronic sensor for salivary diagnostics of stomach cancer, Biosensors and Bioelectronics, vol. 67, pp. 465-471, 2015. D. DeMeo, S. MacNaughton, Z. Wang, X. Zhang, S. Sonkusale, T. Vandervelde, “Heterogeneous metal oxide nanowire microsensor array for gas sensing”, Materials Research Express, vol. 1, no. 2, 025002, 2014. L. H. C. Ferreira, S. Sonkusale, “A 60-dB gain OTA operating at 0.25-V power supply in 130-nm digital CMOS process”, IEEE Transactions on Circuits and Systems - I, vol.61, no. 6, pp. 1609-1617, June 2014. S. Venkatesh, David Shrekenhamer, Wangren Xu, Sameer Sonkusale, Willie Padilla, David Schurig, “Interferometric direction finding with a metamaterial detector”, Applied Physics Letters, vol. 103, 254103, 2014. Y. Zilberman, S Kabiri Ameri, S. Sonkusale, “Microfluidic optoelectronic sensor based on a composite halochromic material for dissolved carbon dioxide detection”, Sensors and Actuators-B Chemical, vol.194, pp. 404-409, April 2014. P. Mostafalu, S. Sonkusale, “Flexible and transparent gastric battery: energy harvesting from gastric acid for wireless endoscopy applications”, Biosensors and Bioelectronics, vol. 54, no.4, pp. 292-296, April 2014. P. Singh, S. Kabiri Ameri, L. Chao, M. N. Afsar, S. Sonkusale, “Broadband metamaterial millimeterwave absorbers based on embedding of dual resonators”, Progress in Electromagnetics Research (PIER), 142, 625-638, 2013. P. Singh, C. Mutzel, S. MacNaughton, S. Sonkusale, “In-situ large area fabrication of multi-layered metamaterials on arbitrary substrates”, Progress in Electromagnetics Research (PIER), 141, 117-133, 2013. W. Xu, S. Sonkusale, “Microwave diode switchable metamaterial reflector/absorber”, Applied Physics Letters, 103 (3), 031902-4, July 2013. C. Kehayias, S. MacNaughton, S. Sonkusale and C. Staii, “Kelvin probe microscopy and electronic transport measurements in reduced graphene oxide chemical sensors”, Nanotechnology, vol. 24, 245502, 2013. A. Hoskinson, P. Singh, S. Sonkusale, J. Hopwood, “Low voltage switchable microplasma arrays using microwave resonators”, IEEE Electron Device Letters, vol. 34, no. 6, June 2013. Y. Liu, C.L. Chen, Y. Zhang, S. Sonkusale, M. L. Wang, M. R. Dokmeci, "SWNT based nanosensors for wireless detection of explosives and chemical warfare agents", IEEE Sensor Journal, vol. 13, no.1, pp.202-209, Jan 2013. Piotr Olejarz, Kyoungchul Park, Samuel MacNaughton, Mehmet R. Dokmeci, Sameer Sonkusale, “A 0.5 μW sub-threshold operational transconductance amplifiers using 0.15 μm fully depleted silicon-on-insulator (fdsoi) process”, Journal of Low Power Electronics and Application, 2(2), pp. 155-167, 2012. W. Xu, W. Padilla, S. Sonkusale, “Loss compensation in metamaterials through embedding of active transistor based negative differential resistance circuits”, Optics Express, Vol. 20 Issue 20, pp.22406-22411, 2012. J. Guo, S. Sonkusale, “A 65nm CMOS digital phase imager for time-resolved fluorescence imaging”, IEEE Journal of Solid State Circuits, vol. 47, no.7, pp. 1731-1742, July 2012 (invited). J. Guo, S. Sonkusale, “CMOS fluorometer for oxygen sensing”, IEEE Sensors Journal, vol. 12, no. 7, pp. 2506-2507, vol.12, no.7, pp. 2506-2507, July 2012. R. Agarwal, M. Trakimas, S. Sonkusale, “Input-feature correlated asynchronous analog to information converter for ECG monitoring”, IEEE Transactions of Biomedical Circuits and Systems, Vol.5, Issue 5, pp.459-467, Oct 2011. G. Morrison, Sam W Thomas III, Christopher N Lafratta, Jian Guo, Manuel Palaciaos, Sameer Sonkusale, David Walt, George Whitesides, L Mahadevan, “Robust error correction in infofuses”, Proceedings of the Royal Society A, vol. 471, no. 2182, pp.1471-2946, Oct 2011. M. Trakimas, S. Sonkusale, “An adaptive resolution ADC architecture for data compression in energy constrained sensing applications”, IEEE Transactions of Circuits and Systems -I, vol. 58, no.5, pp.921-934, 2011. V. Agarwal, S. Sonkusale, “Ultra low-power pvt independent sub-threshold Gm-C filters for low frequency biomedical applications”, Journal of Analog Integrated Circuits and Signal Processing, Volume 66, Number 2, 285-291, 2011. K. Park, T. Harrah, R. P Guertin, E. Goldberg, S.Sonkusale, "Multiplexed sensing based on brownian relaxation of magnetic nanoparticles using a compact AC susceptometer”, Nanotechnology, vol. 22, no. 8, 085501, 2011. A. Duggal, J. Lachapelle, S. Sonkusale, “Calibration of sigma delta converters in synchronous demodulation sensing applications”, IEEE Trans. on Circuits and System –II: Express Briefs, vol. 11, no. 1, pp. 16-22, 2011. D. Shrekenhamer, S. Rout, A. C. Strikwerda, C. Bingham, R. D. Averitt, S. Sonkusale, W. J. Padilla, “High speed terahertz modulation from metamaterials with embedded high electron mobility transistors”, Optics Express, vol. 19 Issue 10, pp.9968-9975, 2011. P. Singh, K. Korolev, M. Afsar, S. Sonkusale, “Single and dual band 77/95/110 GHz metamaterial absorbers on flexible polyimide substrates”, Applied Physics Letters, 99, 264101, 2011. S. Hwang, S. Sonkusale, “Ultra low impedance CMOS potentiostat for environmental sensing applications”, IEEE Sensors Journal, vol.10, no. 4, pp. 820 - 821, 2010. Chia-Ling Chen, Chih-Feng Yang, T. H. Kim, Vinay Agarwal, Sameer Sonkusale, Ahmed Busnaina, Michelle Chen and Mehmet R. Dokmeci, “DNA-decorated carbon nanotubes based chemical sensors integrated onto complementary metal oxide semiconductor circuitry”, Nanotechnology, vol. 21, pp. 095504, 2010. M. Trakimas, S. Sonkusale, “A 0.5V bulk-input OTA with improved common-mode feedback for low-frequency filtering applications”, Journal of Analog Integrated Circuits and Signal Processing, Vol. 59, No. 4, pp. 83-89, 2009. S. Hwang, C. N. LaFratta, V. Agarwal, J. Yu, D. R. Walt, S. Sonkusale, “CMOS microelectrode array for electrochemical lab-on-a-chip applications”, IEEE Sensors Journal, Vol. 9, No. 6, pp. 609-615, 2009. 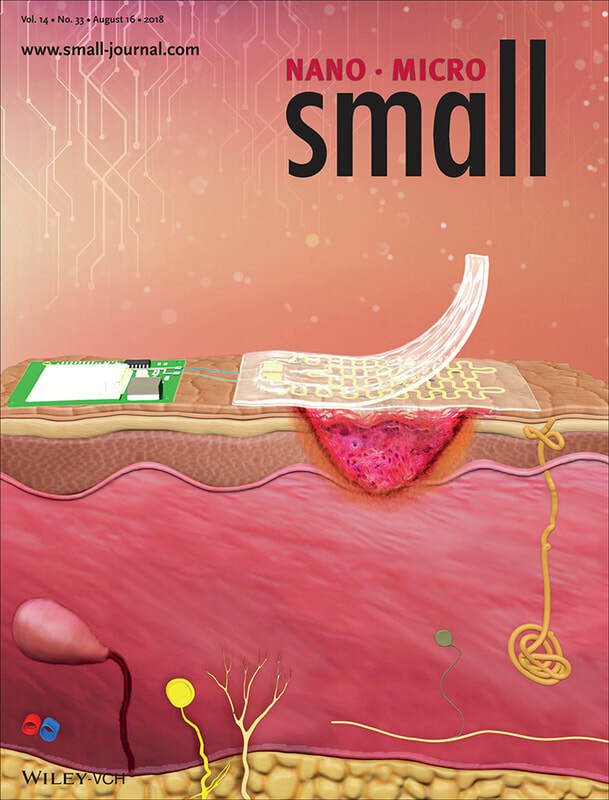 C-L. Chen, V. Agarwal, S. Sonkusale, M. Dokmeci, “Heterogeneous integration of single walled carbon nanotubes onto complementary metal oxide semiconductor circuitry for sensing applications”, Nanotechnology, vol. 20, pp. 225302, 2009. J. Guo, S. Sonkusale, “A high dynamic range CMOS image sensor for scientific imaging applications”, IEEE Sensors Journal, vol. 9, no. 10, pp. 1209 – 1218, 2009. W. Xu, Z. Luo, S. Sonkusale, "Fully digital BPSK demodulator and multi level LSK back telemetry for biomedical implant transceivers”, IEEE Trans. on Circuits and Systems –II: Express Briefs, vol. 56, no. 9 pp. 714-718, 2009. M. Arnecke, J. Guo, S. Sonkusale, D. Walt, “ Design, implementation and field testing of portable fluoroscense-based vapor sensor”, Analytical Chemistry, vol.81, no. 13, pp. 5281-5290, 2009. J. Guo, S. Sonkusale, “An area-efficient and low-power logarithmic A/D converter for current-mode sensor array”, IEEE Sensors Journal vol. 9, no. 10, 2009, pp. 1209-1218, 2009. Z. Luo, S. Sonkusale, “A low power BPSK demodulator for biological implants”, IEEE Transactions On Circuits and Systems: I – Regular Papers, Vol. 55, no. 6, pp. 1478 – 1484, 2008. S. Sonkusale, J. Van der Spiegel, K. Nagaraj, “True background calibration technique for pipelined ADC”, IEE Electronics Letters, Vol. 36, No. 9, pp.786-788, April 2000. Sadeqi, Aydin, Hojat Rezaei Nejad, Gita Kiaee and Sameer Sonkusale, “Cost effective fabrication of chitosan microneedles for transdermal drug delivery”, IEEE Engineering in Medicine and Biology Conference (EMBC), 2018. Trupti Terse, Zimple Matharu, Boyang Lyu, Meera Punjiya and Sameer Sonkusale, “Potentiometric thread-based sensor patch for monitoring ammonium and pH of sweat”, IEEE Engineering in Medicine and Biology Conference (EMBC), 2018. Boyang Lyu, Meera Punjiya, Zimple Matharu and Sameer Sonkusale, “An improved pH mapping bandage with thread based sensors for chronic wound monitoring”, IEEE International Symposium on Circuits and Systems (ISCAS) 2018, accepted. Chen, Yu, Guoqing Fu, Yael Zilberman, Weitong Ruan, Shideh Kabiri Ameri, Eric Miller, and Sameer Sonkusale. "Disposable colorimetric geometric barcode sensor for food quality monitoring." 19th IEEE International Conference on Solid-State Sensors, Actuators and Microsystems (TRANSDUCERS), pp. 1422-1424. IEEE, 2017. Punjiya, Meera, Hojat Rezaei, Muhammed Arif Zeeshan, and Sameer Sonkusale. 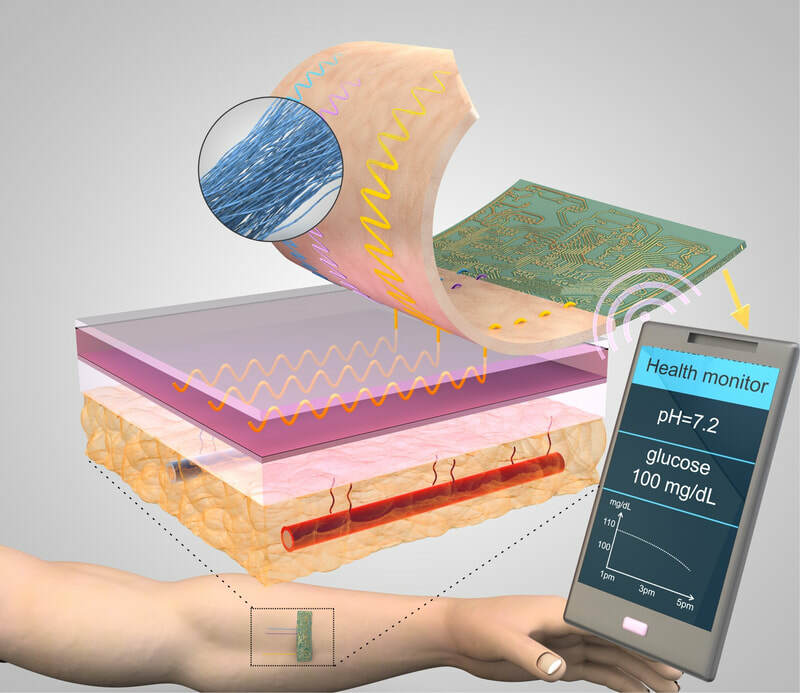 "A flexible pH sensing smart bandage with wireless CMOS readout for chronic wound monitoring." 19th IEEE International Conference on Solid-State Sensors, Actuators and Microsystems (TRANSDUCERS), 2017 19th International Conference on, pp. 1700-1702. IEEE, 2017. Nejad, Hojatollah Rezaei, Meera P. Punjiya, and Sameer Sonkusale. "Washable thread based strain sensor for smart textile." 19th IEEE International Conference on Solid-State Sensors, Actuators and Microsystems (TRANSDUCERS), pp. 1183-1186. IEEE, 2017. Fu, Guoqing, and Sameer Sonkusale. "CMOS sensor for dual fluorescence intensity and lifetime sensing using multicycle charge modulation." IEEE Custom Integrated Circuits Conference (CICC), 2017. Guoqing Fu ans Sameer Sonkusale, “A CMOS Lifetime to Frequency Converter with background calibration”, 2017 IEEE Biomedical Circuits and Systems Conference (BIOCAS), 2017. Andrew M Bourhis, Eric L Miller and Sameer Sonkusale, “Smart cage for 3D tracking of position and orientation of magnetically marked devices”, IEEE Midwest Circuits and Systems Conference (MWSCAS), 2017. Meera Punjiya, Pooria Mostafalu and Sameer Sonkusale, “Smart bandages for chronic wound monitoring and on-demand drug delivery”, IEEE Midwest Circuits and Systems Conference (MWSCAS), 2017. M. Punjiya, H. Rezaei, P. Mostafalu and S. Sonkusale, “pH sensing threads with CMOS readout for smart bandages”, International Symposium on Circuits and Systems (ISCAS), 2017. G. Fu and S. Sonkusale, “CMOS luminesecence lifetime sensor for white LED multispectral characterization”, International Symposium on Circuits and Systems (ISCAS), 2017. P. Mostafalu, M. Akbari, K. Alberti, Q. Xu, A. Khademhosseini, and S. Sonkusale, “Thread diagnostics: Microfluidics and sensors on thread”, International Conference on Minitaurized Systems for Chemistry and Lifesciences (MicroTAS) 2016. C. H. Moon, S. Kabiri Ameri, M. Armbruster, R. Gill, C. G. Dulla and S. Sonkusale, “Flexible and transparent graphene electrode array for recording neural activity, International Conference on Minitaurized Systems for Chemistry and Lifesciences (MicroTAS) 2016. S. Kabiri Ameri, P. K. Singh, R. D’Angelo, W. Stoppel, L Black and S.R. Sonkusale, “Three dimensional graphene scaffold for cardiac tissue engineering and in-situ electrical recording”, IEEE Engineering in Medicine and Biology Conference (EMBC), 2016. M. Punjiya, C. Moon, and S. Sonkusale, “Multi-analyte paper-analytical-device (PAD) with CMOS integration for point of care diagnostics”, International Symposium on Circuits and Systems (ISCAS), CASFEST, 2016. R. D’Angelo and S. Sonkusale, “Precise time mode multiplier using digital primitives and passive components”, International Symposium on Circuits and Systems (ISCAS) 2016. K. Park, S. Kabiri Ameri, and S. Sonkusale, "Design of Electrodes and Circuits for Cell trapping on CMOS", IEEE Biomedical Circuits and Systems Conference (BIOCAS), 2015. P. Mostafalu, S. Amugothu, A. Tamayol, S. Bagharifard, M. Akbari, M. R. Dokmeci, A. Khademhosseini, and S. Sonkusale, "Smart flexible wound dressing with wireless drug delivery", IEEE Biomedical Circuits and Systems Conference (BIOCAS), 2015. Pengxiang Hu, Yu Chen and S. Sonkusale, "Low cost spectrometer accessory for cell phone based optical sensor, IEEE Virtual Conference on Application on Commercial Applications of Sensors (VCACS), 2015. P. K. Singh, J. Hopwood and S. Sonkusale, "Metamaterials for wireless generation of microplasma array", 6th International Conference on Metamaterials, Photonic Crystals and Plasmonics (META), 2015. S. Rout, and S. Sonkusale, "Real-time continuous-wave amplitude terahertz modulation system based on active metamaterials",6th International Conference on Metamaterials, Photonic Crystals and Plasmonics (META), 2015. Shideh K. Ameri, P. K. Singh and S. Sonkusale, "Three dimensional graphene foam for ultrasensitive pH sensing", 18th Conference on Solid State Sensors Actuators and Microsystems, Transducers 2015. P. Mostafalu, S. Mostafalu, J. K. Mann, M. Punjiya and S. Sonkusale, "Highly selective electrochemical approach for detection of DA, AA and 5-HT with material diversity and chemometrics on paper, 8th Conference on Solid State Sensors Actuators and Microsystems (Transducers), 2015. K. Park, S. K. Ameri and S. Sonkusale, "CMOS Dielectrophoretic Lab-on-chip platform for manipulation and monitoring of cells", IEEE Engineering in Medicine and Biology Conference (EMBC), 2015. S. Sonkusale, "Paper based biomedical diagnostics and therapy for resource limited settings", Mini symposium at IEEE Engineering in Medicine and Biology Conference (EMBC), 2015. Invited paper. C. Schwarze and S. Sonkusale, “Smart CMOS sensor for wideband laser threat detection”, SPIE Optical Engineering+ Applications (SPIE Optics & Photonics), 2015. S. Sonkusale, "Terahertz metamaterials for modulation and detection", SPIE Sensing Technology and Applications, Baltimore (SPIE-DSS), 2015. Invited paper. G. Fu and S. Sonkusale "Broadband resonant wireless power transfer using a metamaterial resonator embedded with non-foster impedance circuitry", IEEE Antennas and Propagation Systems/ URSI Conference (APS-URSI), Vancouver 2015. Invited paper. M. Punjiya, P. Mostafalu and S. Sonkusale, "Low cost paper based electrochemical sensors with CMOS Readout IC", IEEE Biomedical Circuits and Systems Conference (BIOCAS), 2014. S. Bagherifard, A. Tamayol, M. Comotto, P. Mostafalu, M. Akbari, N. Annabi, M. Ghaderi, S. Sonkusale, M. Guagliano, M. R. Dokmeci and A. Khademhosseini, "Hydrogel based dermal patch with integrated flexible electronics for on-demand drug delivery", International Conference on Minitaurized Systems for Chemistry and Lifesciences (MicroTAS) 2014. Y. Zilberman, S. Sonkusale, "Portable microfluidic optoelectronic device for salivary diagnostics of stomach cancer", Solid State Sensors, Actuators and Microsystems Workshop (HILTON HEAD), June 2014. L. H. C. Ferreira, S. Sonkusale, “A 60-dB gain OTA operating at 0.25V power supply in 130-nm digital CMOS process”, IEEE International Symposium on Circuits and Systems (ISCAS) June 2014. R. D’Angelo, S. Sonkusale, “A time mode translinear principle for implementing analog multiplication”, IEEE International Symposium on Circuits and Systems (ISCAS) June 2014. R. D'Angelo, M. Trakimas, S. Aeron, S. Sonkusale, “Experimental results on wideband spectrum sensing using random sampling ADC in 90nm cmos”, IEEE International Conference on Circuits and Systems (ISCAS) 2013. R. Rahimi, G. Chitnis, P. Mostafalu, M. Ochoa, S. Sonkusale, B. Ziaie, “A low-cost oxygen sensor on paper for monitoring wound oxygenation”, International Conference on Microtechnologies in Medicine and Biology (MMB) 2013. P. Mostafalu, S. Sonkusale, “Energy harvesting from gastric acid for endoscopy applications”, International Conference on Microtechnologies in Medicine and Biology (MMB) 2013 (presentation only). R. D'Angelo, M. Trakimas, S. Sonkusale, S. Aeron, “Compressed sensing of EEG using a random sampling ADC in 90nm cmos”, IEEE Body Sensor Network Conference (BSN) 2013. Luis Ferreira, Sameer Sonkusale, "A hybrid multi-tanh bulk-driven input stage OTA for low-THD biomedical Gm-C applications", IEEE International Symposium on Circuits and Systems (ISCAS), May 2012. Michael Trakimas, Timothy Hancock, Sameer Sonkusale,” A compressed sensing analog-to-information converter with edge-triggered SAR ADC core", IEEE International Symposium on Circuits and Systems (ISCAS), May 2012. Jian Guo, Sameer Sonkusale, "A 22-bit 110ps time-interpolated time-to-digital converter", IEEE International Symposium on Circuits and Systems (ISCAS), May 2012. Nick L. Marcoux, Christopher J. Fisher, Doug White, John Lachapelle, Tomas Palacios, Omair Saadat, Sameer Sonkusale, “A new GaN HEMT nonlinear model for evaluation and design of 1-2 watt power amplifiers”, IEEE Midwest Symposium on Circuits and Systems (MWSCAS) August 2012. J. Guo, S. Sonkusale, “A CMOS imager with digital phase readout for fluorescence lifetime imaging”, European Solid State Circuits Research Conference (ESSCIRC) 2011. J. Guo, S. Sonkusale, “A single chip fluorometer for fluorescence lifetime spectroscopy”, IEEE Sensors Conference (SENSORS) 2011. S. MacNaughton, S. Ammu, S. Surwade, S. Manohar, S. Sonkusale, “Electronic nose based on graphene, nanotube and nanowire chemiresistor arrays on silicon”, IEEE Sensors Conference (SENSORS) 2011. Y. Liu, C-.L.Chen, V. Agarwal, S.Sonkusale, M.L. Wang, M.R. Dokmeci, “Single chip nanotube sensor for chemical agent monitoring”, Transducers 2011, Beijing, June 2011. D. Shrekenhamer, S. Rout, A. Strikwerda, C. Bingham, R. Averitt, S. Sonkusale, W. Padilla, “High speed terahertz modulation from metamaterial with embedded high electron mobility transistors”, 5th Intl Congress on Advanced Electromagnetic Materials in Microwave and Optics, (Metamaterials) 2011. Chia-Ling Chen, Chih-Feng Yang, Vinay Agarwal, Sameer Sonkusale, Michelle Chen, Mehmet Dokmeci, “Exploring sequence dependence in DNA-decorated CNT gas sensors on CMOS circuitry”, IEEE Sensors Conference (SENSORS) 2010. S. Rout, D. Shrekenhamer, S. Sonkusale, W. Padilla, “ Embedded HEMT/metamaterial composite devices for active terahertz modulation”, IEEE Photonics Conference, (Photonics) 2010. C.-L. Chen, C.-F. Yang, V. Agarwal, S. Sonkusale, A. Busnaina, M. Chen, M. R. Dokmeci, "SS-DNA-decorated single walled carbon nanotubes integrated on CMOS circuitry for high sensitivity gas sensing", International Conference on Solid-State Sensors, Actuators and Microsystems (Transducers), 2009. K. Park, T. Harrah, R.P. Guertin, E. Goldberg, S. Sonkusale, "Multiplexed detection for biomolecules tagged to magnetic nanoparticles using a miniaturized ac magnetic susceptometer", IEEE Sensors Conference (SENSORS) 2009. S. Hwang, S. Sonkusale, "Ultra low-input impedance CMOS potentiostat for environmental sensing applications", IEEE Sensors Conference (SENSORS) 2009. R. Agarwal, M. Trakimas, S. Sonkusale, “Adaptive asynchronous analog to digital conversion for compressed biomedical sensing”, IEEE Biomedical Circuits and Systems Conference (BioCAS), 2009. Mike Trakimas, Sameer Sonkusale, “A 0.8V asynchronous ADC for energy constrained sensing applications”, IEEE Custom Integrated Circuits Conference (CICC), 2008. Jian Guo, Sameer Sonkusale, “An auto-switched mode CMOS image sensors for high dynamic range scientific imaging applications”, IEEE Sensors Conference (SENSORS), 2008. Chia-Ling Chen, Vinay Agarwal, Sameer Sonkusale and Mehmet R. Dokmeci, “Integration of single-walled carbon nanotubes on to CMOS circuitry with parylene-c encapsulation”, IEEE International Conference on Nanotechnology, (IEEE NANO) 2008. Best paper award. Yiling Zhang, Valencia Joyner, Ruida Yun, Sameer Sonkusale, “A 700mbit/s CMOS capacitive feedback front-end amplifier with automatic gain control for broadband optical wireless links”, IEEE International Symposium on Circuits and Systems (ISCAS), 2008. V. Agarwal, S. Sonkusale, “A PVT independent subthreshold constant-gm stage for very low frequency applications”, IEEE International Symposium on Circuits and Systems (ISCAS), 2008. Sameer Sonkusale, Zhenying Luo, “A complete data and power telemetry system utilizing BPSK and LSK signaling for biomedical implants”, IEEE Engineering in Medicine and Biology Conference (EMBC) 2008. Sungkil Hwang, Vinay Agarwal, Christopher Lafratta, David Walt, Sameer Sonkusale, “A minitaurized CMOS microelectrode array system for single droplet electrochemistry applications”, International Conference on Minitaurized System for Chemistry and Lifesciences (MicroTAS), 2008. Jian Guo, Sameer Sonkusale, “Current mode readout circuits with pixel level logarithmic ADC for IR-FPA applications", IEEE Midwest Symposium on circuits and systems (MWSCAS), 2008. Krenar Komoni, Sameer Sonkusale, Geoff Dawe, “Fundamental performance limits and scaling of a CMOS passive double balanced mixer”, IEEE Northeast Workshop on Circuits and Systems (NEWCAS), 2008. Krenar Komoni, Sameer Sonkusale, Geoff Dawe, “Modeling, simulation and implementation of a passive mixer in 130nm CMOS technology and scaling issues for future technologies”, IEEE Midwest Symposium on Circuits and Systems (MWSCAS), 2008. Sameer Sonkusale, Zhenying Luo, “A wireless data and power telemetry system using novel BPSK demodulator for non-destructive evaluation of structures”, IEEE Sensors Conference (SENSORS), 2007. Zhenying Luo, Sameer Sonkusale, “A novel low power bpsk demodulator”, IEEE International Symposium on Circuits and Systems (ISCAS), 2007. Michael Trakimas, Sameer Sonkusale, “A 0.5V bulk-input operational transconductance amplifier with improved common-mode feedback”, IEEE International Symposium on Circuits and Systems (ISCAS), 2007. Jon Chow, Wing Siu, Yasumichi Iwamoto, Matt Toia, Sameer Sonkusale, “A multipass spatial and temporal image filtering APS CMOS image sensor”, IEEE Midwest Symposium on Circuits and Systems (MWSCAS) 2006. M. Dapthary, S. Sonkusale, “Broadband Capacitive Sensor CMOS Interface Circuit for Dielectric Spectroscopy”, IEEE International Conference on Circuits and Systems (ISCAS), 2006. S. Sonkusale, Y. Kim, A. Agarwal, “A CMOS Front End IC for Fluctuation Enhances Sensing”, IEEE International Sensors Conference (SENSORS) 2005. A. Agarwal, Y. Kim, S. Sonkusale, “Low power current mode ADC for CMOS Sensor IC”, IEEE International Conference on Circuits and Systems (ISCAS), 2005. Y. Kim, A. Agarwal, S. Sonkusale, “Broadband dielectric spectroscopy CMOS readout circuit for molecular sensing”, IEEE International Conference on Circuits and Systems (ISCAS), 2005. N. Stefanou, S. Sonkusale, “Achieving higher dynamic range in averaging flash A/D converters”, IEEE Systems on Chip Conference (SOCC), 2004. A. Larsson, S. Sonkusale, “A background calibration scheme for pipelined ADC including non-linear operational amplifier gain correction and reference error compensation”, IEEE System on Chip Conference (SOCC), 2004. S. Sonkusale, M.Cheng, L. Kish, Y. Kim, A. Agarwal, C. Liu, S. Seo, "A CMOS sensor array IC of nanowell devices for molecular sensing", IEEE Sensors Conference (SENSORS), 2004. S. Sonkusale, L. Kish, W. Marlow, A. Agarwal, Y. Kim, "A CMOS sensor array IC of van der waals enhanced mosfets and taguchi type sensors", IEEE Sensors Conference (SENSORS) 2004. N. Stefanou, S. Sonkusale, “An average low-offset comparator for 1ghz flash A/D converter in 0.18um CMOS”, IEEE International Conference on Electronics, Circuits and Systems (ICECS), 2004. X. Wang, Z. Shi, S. Sonkusale, “A robust offset cancellation scheme for analog multipliers”, IEEE International Conference on Electronics, Circuits and Systems (ICECS), 2004. N. Stefanou, S. Sonkusale, “High speed array of truly binary random number generators”, IEEE International Symposium on Circuits and Systems (ISCAS), 2004. S. Sonkusale, J. Van der Spiegel, “Mixed-signal calibration of pipelined analog-digital converters”, IEEE International System on Chip Conference (SOCC), 2003. S. Sonkusale, J. Van der Spiegel, “A low distortion CMOS sampling circuit”, IEEE International Symposium on Circuits and Systems (ISCAS), 2002. S. Sonkusale, J. Van der Spiegel, K. Nagaraj, “Background digital error correction technique for pipelined analog-digital converters”, IEEE International Symposium on Circuits and Systems (ISCAS) 2001. Aydin Sadeqi, H. R. Nejad and S. Sonkusale, “3D printed metamaterials for high frequency applications”. MRS Fall Meeting 2018. M. Punjiya, H. R. Nejad, Caleb Neufeld, Q. Xu and S. Sonkusale, “A simply fabricated DEP tweezer for cell patterning and electroporation”, MRS Fall Meeting 2017. Y. Chen. R. E. Owyeung and S. Sonkusale, “ Paper based combined optical and electronic nose platform for detection of volatile gases”, MRS Fall Meeting 2017. Y. Chen, G. Fu, Y. Zilberman, W. Ruan, E. Miller and S. Sonkusale, “Smartphone based food quality monitoring using paper-based colorimetric sensor”, MRS Fall Meeting 2017. P. Singh, S. Kabiri Ameri, S. Sonkusale, “Metamaterials on fabrics using the paint process”, MRS Fall Meeting, Boston 2013, oral presentation. S. MacNaughton, D.F. DeMeo, S. Sonkusale, T.E. Vandervelde, “Electrochemically deposited copper oxide and zinc oxide nanowire photovoltaic cells”, 2010 Material Research Society (MRS) Fall Meeting, Boston MA. S. MacNaughton, S. Sonkusale, "Copper / Copper Oxide coreshell nanowire assemblies integrated on CMOS for sensor applications", Materials Research Society (MRS) Fall Meeting, Boston, MA, November 30- December 4, 2009. C.-L. Chen, N. Valim, C.-F. Yang, V. Agarwal, S. Sonkusale, A. Busnaina, M. Chen, M. R. Dokmeci, " Single-walled carbon nanotube chemical sensors integrated on to CMOS circuitry for environmental monitoring," Materials Research Society (MRS) Fall Meeting, Boston, MA, November 30- December 4, 2009. C.-L. Chen, N. Valim, C.-F. Yang, V. Agarwal, S. Sonkusale, A. Busnaina, M. Chen, M. R. Dokmeci, " Integration of DNA functionalized SWNT onto CMOS circuitry for environmental monitoring," Nanoelectronics Devices for Defense and Security Conference (NANO-DDS), Fort Lauderdale, FL, Sept 28-Oct 2, 2009. C.-L. Chen, V. Agarwal, H. Pan, S. Sonkusale, M. R. Dokmeci, "Heterogeneous integration of single-walled carbon nanotubes with cmos circuitry", Nanotubes, Nanowires, Nanobelts, and Nanocoils--Promise, Expectations, and Status, Materials Research Society (MRS) Fall Meeting, Boston, MA, December 1-4, 2008. S. Rout and S. Sonkusale, Active Metamaterials, Springer International Publishing, DOI: 10.1007/978-3-319-52219-7, 2017. Guoqing Fu (PhD), A CMOS luminescence sensor for intensity and lifetime dual sensing, Completed Jan 2018. G. Kiaee (MS), A pH mediated electronic wound dressing for controlled drug delivery, Completed Dec 2017.